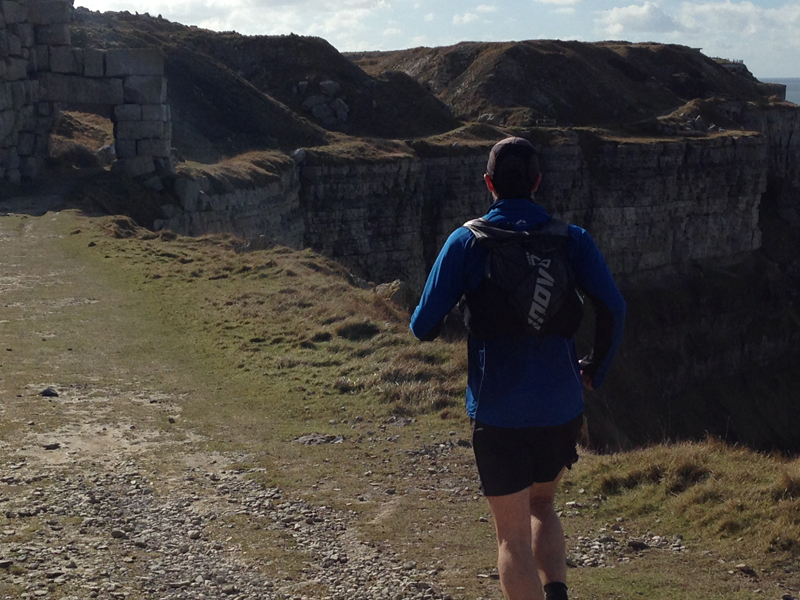 I had the opportunity to trial the new Inov-8 Race Vest 10 and my first impressions are detailed below. 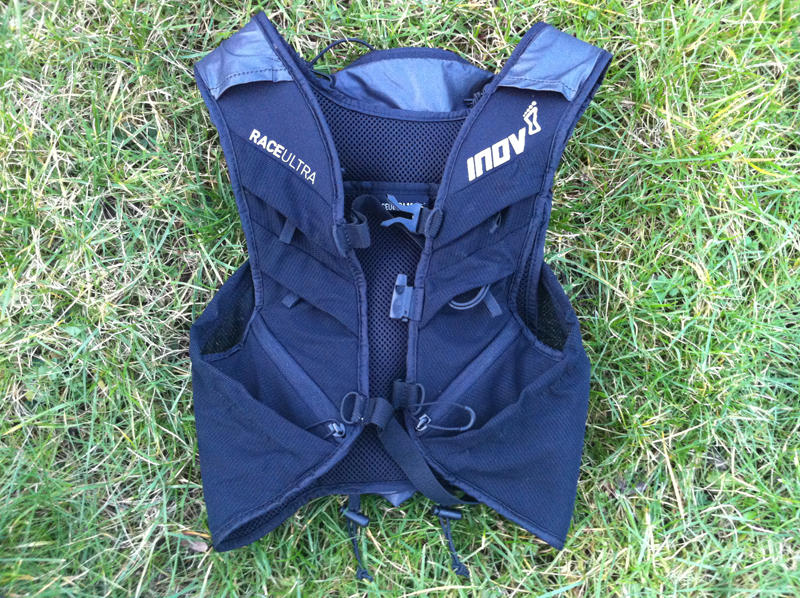 Inov8 released the Race Ultra vest about a year ago and it has become a fairly popular choice judging by the number of times I have seen it at races and I also purchased one myself which is probably my go to pack for races where kit requirements are not too extensive. However, the major limitation was the lack of capacity for longer races where there were more onerous mandatory kit requirements. Therefore, the new Inov8 Race Ultra pack race pack has been designed to address this need for more capacity and comes in 5L and 10L versions. I had the opportunity to test the 10L version. 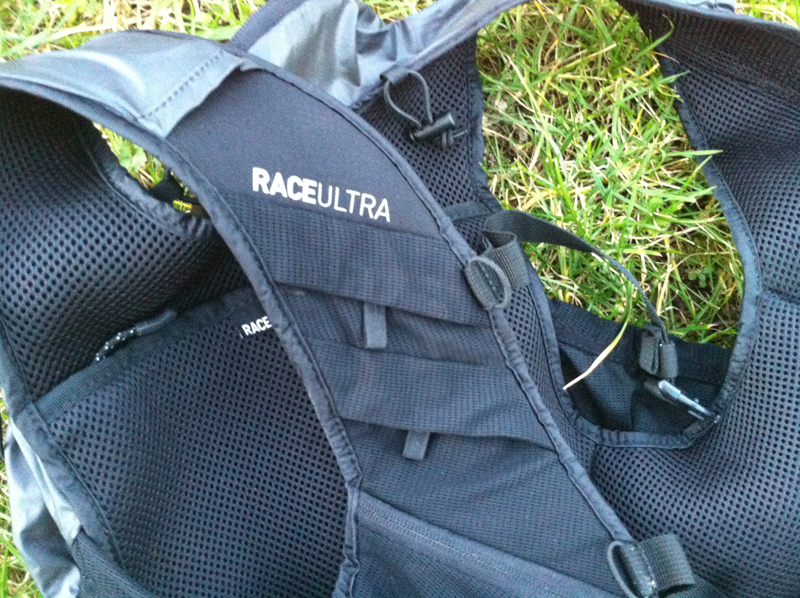 The pack is similar in design to the previous Race Ultra vest. Thankfully, they have changed the fiddly pin clip of the previous version to a more traditional slide-in clip. The front boasts 8 pockets, with 2 each side of the chest and the bottle pouch on the previous version has been replaced with a smaller zipped pocket which houses the soft flask and is surrounded by a small “dump” pocket. There is also a small whistle on the front but it is not very loud and its debatable whether this would pass kit check for some mountain races. Inside of the pack is a pocket which can be used to store items you would like to get to easily. There is a rear bungee compression cord on the back for tightening the pack or perhaps carrying something outside the pack. The back of the pack boasts a zipped compartment which holds up to 10L of kit and there is an extra zip which allows access to a separate reservoir compartment. The pack comes with 2 x 500ml soft flasks attached to “straw”tubes. Please note that the water bottles from the previous Inov8 Race Ultra vest (which I own) are not compatible with this pack. You ‘could’ just about squeeze with flat design water bottles into the zipped pocket but it wouldn’t slip in and out easily and isn’t designed for this pack. I trialled the pack on a few short runs but the main test was over a weekends hiking and running along the South West Coast Path. I was visiting this area as part of a recce for a future race and had elected to bring all the mandatory kit to test the packs suitability. I spent two full days using the pack and was pleased to say it got a good workout. In particular the changeable weather conditions on the second day (i.e. 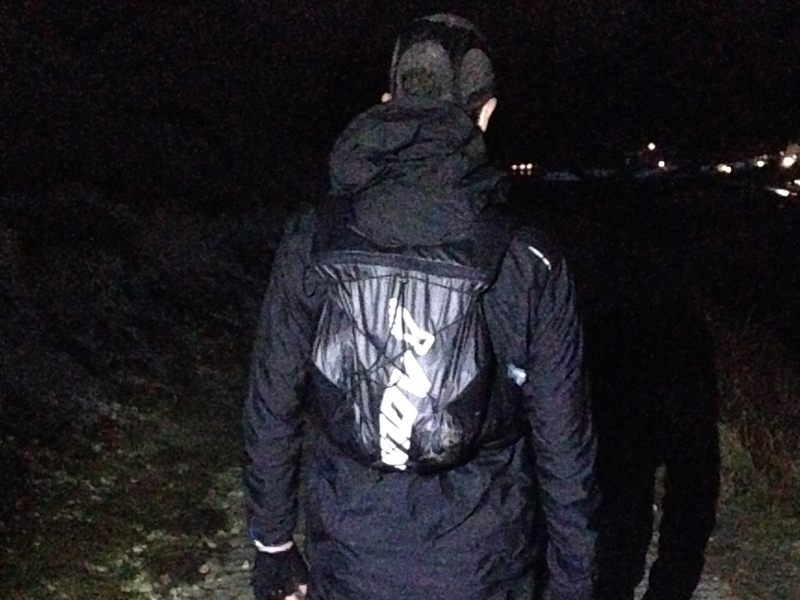 wind and heavy rain) meant that in addition to trialling the comfort and design of the pack, I was also testing its ease of use by accessing the pack on a number of occasions to access my waterproofs, hats or other food/equipments and its weather resistance! 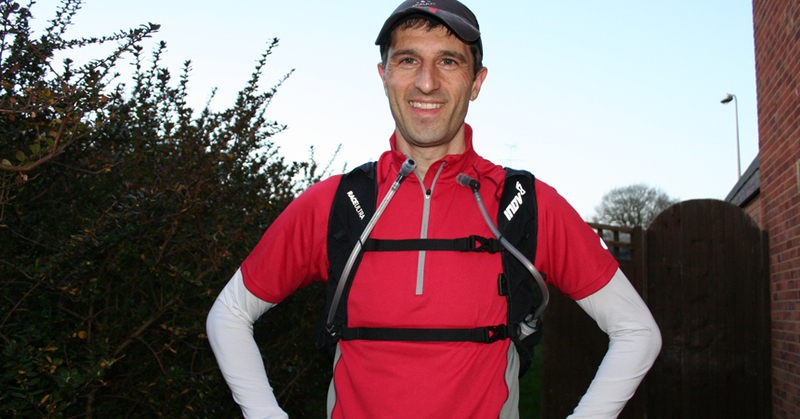 I liked the style and design of the Inov 8 Race vest partly as an owner of last years version. The front pockets are slim, accessible and the right size for small items such as your phone and i-Pod or snack. The pack is also very lightweight (about 260g for the S/M 10L version and 265g for the M/L 10L version) and felt comfortable to use (see my note on sizing below though). I also thought the dump pockets and the side were particularly useful for litter or small items aswell such as a snack but items are not secure in this pocket if you remove the pack. The rear compartment offers plenty of space and the contents are easily accessible via a zip across the top. I don’t know why other race vests don’t have a zip across the rear compartment (i.e. previous Inov8 Race vest and Salomon S-lab) as it gives you greater security that something won’t fall out and can protect it from the elements more. I’m not a fan of these fold over style clips to be honest. The zip is quite wide giving you easy access to kit in the rear compartment. I could carry all of my required mandatory kit for the race (including maps, waterproof map case, extra layer, leggings, food, head-torches, compass, whistle, hat, gloves) and there was room to spare. This area of the pack had more of a pronounced bulge on the back as it sits higher up on your back but it didn’t feel uncomfortable. The newer design with more space on the back means the pack can be used across a variety of events from a short ultra to one where there are mandatory kit requirements. I can usually fit most of the kit in the Inov8 race vest even up to say a typical Centurion 100 mile event but this would probably not be possible for a coastal or mountain type ultra runs where there are additional requirements such as full body covering or full waterproofs and extra layers for example. After trying out the hydration system, I can’t say I was comfortable with the design. The two hydration straws seemed to flap about in front of me whilst running and started to become a minor annoyance. You could cut the tubes slightly to make these lower and less likely to swing in your face but I elected to replace the hydration tubes with screw on tops to the soft flasks to avoid this concern (my screw on tops from the Salamon soft flasks fitted). I generally use a pack with soft flasks or bottles (Inov8 Race Ultra Vest – original or a Salomon Slab 12) and like the freedom to slip them out of a pack, drink away and refill them quite quickly. The soft flask pockets sat up to the side of my rib-cage area and I didn’t find it easy to slip the soft flasks in or out when trying to drink from them or re-fill them to be honest. The pack was comfortable and fitted tightly around your body. However, I felt these packs came up a little small. As a 36” chest I tend to use the Small/Medium size as opposed to the Medium/Large. If you are considering buying this pack and are on the border between the S/M or M/L then I would suggest you go for the larger size. I’m not sure if the race vest was intended to be used without the straws or not and the sizing concern may have been a factor in my views of the lack of ease of use of the soft flask holders so something to consider. In fact it was a little easier to access the soft flasks by putting these into the dump pockets which were positioned on the side under the armpit. 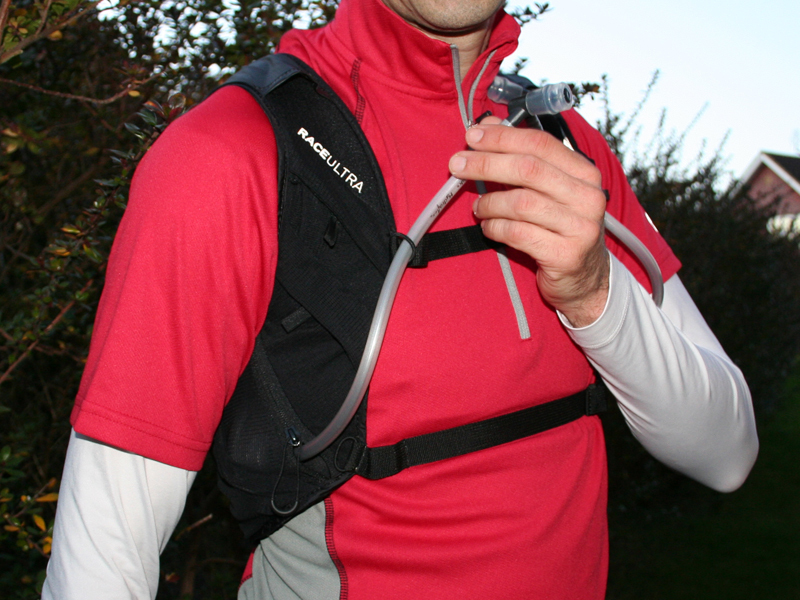 If you don’t own a race vest (such as the S-Lab Advanced Skin Race Vests) then this is a viable alternative if you are happy with this particular hydration system on the pack (i.e. soft flasks and the straws). Unfortunately, the hydration system didn’t suit me personally and this was the only real negative area and I guess it’s a matter of personal preference. The pack is comfortable, very light weight, offers plenty of space in the rear compartment which is easily accessible but would suggest you size “up” if you are a borderline Medium size. 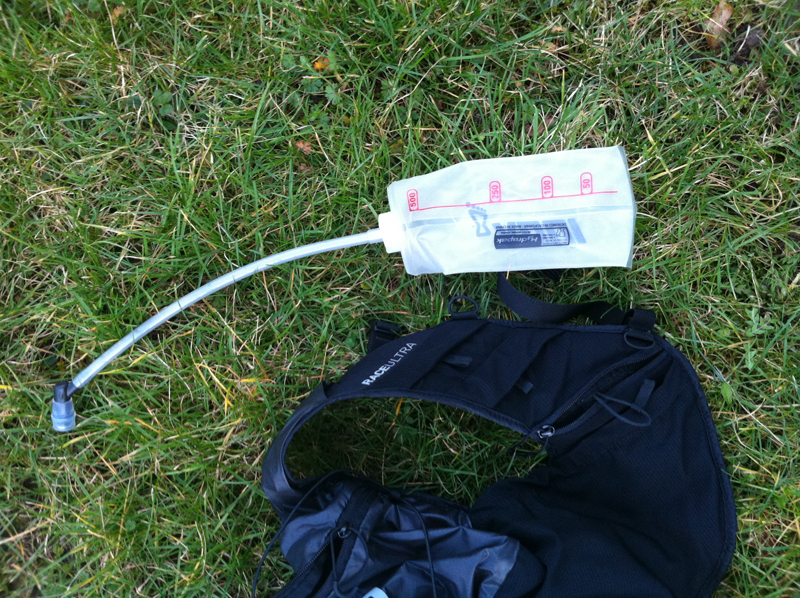 If you asked me what would it take to turn this into the ‘perfect’ pack for me, then I would change the hydration system to the front mounted bottles, and perhaps add zips to the smaller pockets on the front and make sure I was happy with the sizing but that would be about it. The pack is available to purchase in 5L and 10L sizes from the ULTRAmarathonRunningStore at the link here (10L) or here (5L) who kindly supplied the pack for trial and review. Why don’t you put the straw nozzles under the fabric coming from the back on your shoulders? No problem, hope the information helped. You mention the Salomon S-Lab in the review but don’t make any comparisons between the packs. I’ve narrowed it down to either he Inov8 Ultra Pack 10 or the Salomon S-Lab Advanced Skin3 12 Set mouthful but are you able to offer any pros/cons between the two models with reasoning? Whilst looking for a review of the Salmon product on your blog I saw lots of pics of you wearing the 2014 model so you obviously understand the requirements and both products. Hello, both are good packs. Personally (and this is subjective I know) I prefer the soft flasks and fit of these on the S-lab compared to the Inov8 (didn’t get on with the Inov8 bottles/straws). 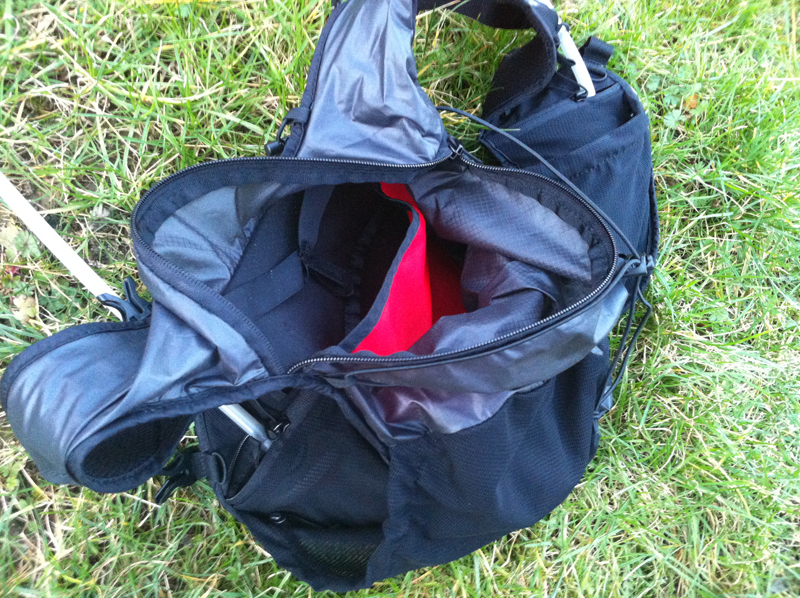 However, I did prefer the all in one compartment on the back of the Inov8 over the S-lab which I felt was easier to store more kit easily (the S-lab has a small zipped compartment on top and a stretch compartment underneath). That probably doesn’t help you though! Thanks Paul, without trying the Inov8 the zip pockets for bottles seem a bit weird but I thought the straws could go into the shoulder straps like the tube for the Salomon. 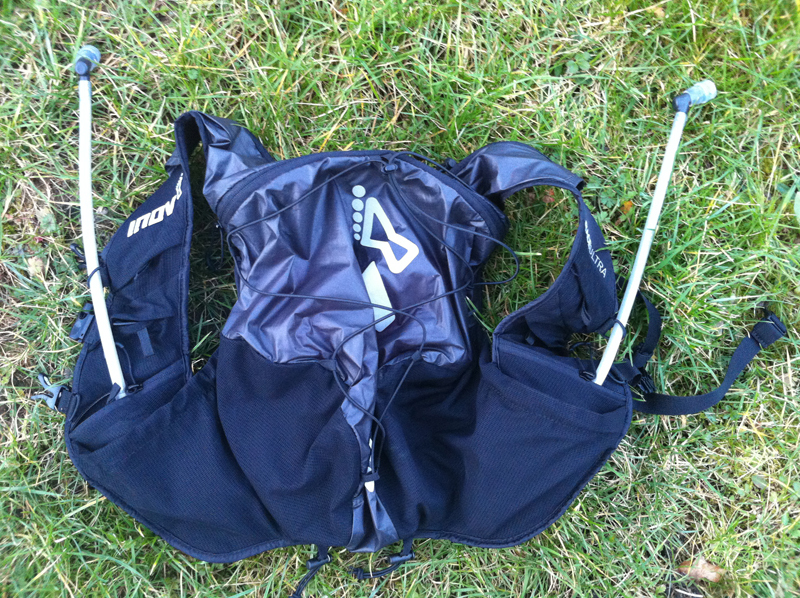 The Inov8 seemed a bit wider and less breathable on the back but more water resistant. Are you able to confirm? The Inov8 also appears a bit more durable but this the model I haven’t been able to play with. Hi Ants, I don’t have the Inov8 pack anymore after the trial. From memory the Inov8 had a single zipped rear compartment whilst the s-lab had a smaller top zipped compartment and then the wider mesh pockets at the bottom (with less water resistance as these were exposed). Breathability of the packs I didn’t consider to be an issue on either. Main issue for me with the Inov8 was the hydration system (straws) which I didn’t get on with (others might) so I will personally stick the the Race Ultra Vest with bottles for shorter races and the S-Lab when I need to carry a bit more kit.. That’s until the next shiny new bag comes along! Hmm..looks like the solution would be to either attach the top of the tube with magnetic clips from Hydrapak, or a Camelbak clip or use a lo-tech retractor (the kind you use for ID cards/keys)..I think the soft flasks with tubes are brill! They allow you to refill without fiddling with taking out a bladder from its compartment..
Hi Paul, I see you haven’t got this pack anymore after your trial with it, but was wondering on sizing. I’ve just received mine in a M/L and am also a 36″ chest and usually wear small in tees, jackets, baselayer etc. I’m having to cinch it in quite far, even with a few bits in the various pockets. How much adjustment did you have left on both chest straps on your S/M? I sized up based on your review, but not sure if it’s a little spacious on the shoulders? Cheers Paul, think I may end up swapping soon then. Thanks for the useful reply on an old post too! Hi,I read your blog named “Inov-8 Race Ultra 10 Vest Pack Review | Paul Ali Ultramarathon Runner” daily.Your humoristic style is awesome, keep up the good work! And you can look our website about daily proxy.